External USB 3.0 DVD CD Drive support Macbook, PC, laptop. You can watch movies, player games, listen musics. Also can copy transfer files, movies to a CD/DVD, install software and creat backup discs etc. Easy operation:Plug and play; No external power supply and driver needed. Travel easily:With portable and compact design, it is convenient for you to view DVD movies, listen to CD music, watch photos on your journey. 2. Desktops connection: please connect the device to the motherboard USB port for normal use. 3. This drive is not fully compatible with computers of windows 10 system due to the compatibility issues between windows 10 itself and the external hardwares. We suggested that you download VLC Media player to Play DVD and CD. 4. Please make sure the laptop is with sufficient power supply, a low capacity may cause the device can't be recognized. 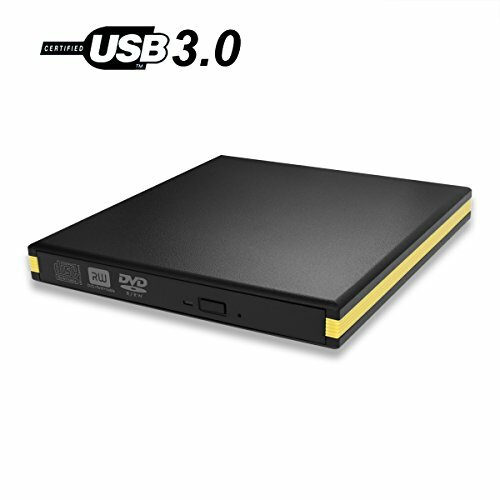 ◎ USB 3.0 high Speed Interface - With USB 3.0 interface, which provides faster data transfer rates to Max DVD read speed 8X; Max CD read speed 24X and max CD burn speed 8X. Bring you faster and smooth experience during movies, musics or burning. ◎ High Performance - Stable performance with strong error-correction ability, support CD/DVD ROM, CD-R/RW, DVDR, DVDRW. Containing noise reduction technology and low power consumption, you can easily watch the DVD video, copy the music file, install the software or create a backup CD. ◎ Wide Compatibility - The external cd dvd reader support Windows XP/ Vista/ 7/ 8/10, all version of Mac OS system. Support Laptop, Notebook, PC, Desktop Computer. It is backwards compatible with USB 2.0 and USB 1.0. ◎ Ultra Slim Portable Design - Lightweight body makes it easy to carry anywhere, you can put this external DVD player in the traveling bag or on your desk.